← Game Design Theory: When Is A Skirmish Not A Skirmish? This comes out on the 7th Nov. This entry was posted in Random Thoughts and tagged Gates of Antares, GW. Bookmark the permalink. I was always under the impression that GW operated in a vacuum ignoring other companies existing in the industry. The release of AoS at the same time as KoW was due to release just reinforced that for me – I mean surely if they’d either been a few months earlier or a few months later Mantic’s sales wouldn’t have been quite so impressive! I’d say mostly that was true, but not exclusively. Except Mantic mightve timed their release to coincide with GWs. Pretty likely, considering theyre ex-GW. I can’t remember perfectly but I’m pretty sure the KoW kickstarter was on near the start of the End Times stuff so I doubt Mantic could predict when Warhammer proper would end. They certainly refused to delay the launch of KoW when delays meant that kickstarter backers would be receiving their products at the same time as the preorders – something they historically avoided. Not that I blame them, even though I am still waiting for my kickstarter! After all in 5 years I will appreciate a bigger community to game against than having my book a month or two before everyone else! @Bobalot: Sure, it wasnt timed perfectly, but what Im saying is: They knew Warhammer was going to crash and burn soon, AoS was coming. That was why they did the KoW kickstarter. It was originally planned to come *after* Warpath, they switched those two to ensure KoW would be ready when AoS dropped. Well the 30K thing has been one of those unavoidable ‘soon’ moments for GW. Both as the IP is massively popular and it’s a great product line to both get more money out of their core audience while trying to offset any potential side-effects of the whole Age of Sigmar thing. At the same time they are more and more moving towards an IP management and digital licensing approach, so there are some people, somewhere over there who seem to have a strategy. And I think there’s no denying that it would not be beneath or too dirty for GW to intentionally plan a major release to try and offset serious competing product lines. Not that I think this will do it, as the GW release and promotion approach seems clearly focused on the ‘drinking the coolaid’-approach and the existing, massively invested customer base, while other games actively promote their new products and focus on community interaction both for traction and feedback purposes. Two different approaches as well two different types of customers, though not necessarily gamers. I really doubt it. People looking for a more “hard” sci-fi setting with a more adult theme are the target of Antares. People who cannot possibly own enough Space Marines are the target of Horus Heresy. No relation at all. Just bad luck for Warlord. GW probably set this date months ago and Warlord would not want to release at the same time. This is a very highly anticipated GW release allowing fan boys to buy all their space marines again just at new higher prices. Cheaper than Forgeworld but still mass produced plastic army men. Just with slightly different helmets, and bolters. I think the real conspiracy is where are my missing Dungeon Saga Missions? I was more talking about Black Fortress, Green Tide, and Unholy Crusades. Jake I am also going to assume that you do not really think it is funny that a project you were lead game designer failed to deliver 19 of 42 promised new scenarios. Yeah there’s a lot of promised content missing (still? ), from missions in expansions to digital story arcs and even professions in the Adventurer’s Companion. A book which on the whole should not have been shipped out to backers in it’s current state. Now I’m a former GW fanboy, so I’m more than used to lugging around big, heavy rulebooks with just about the same amount of printed materials worth of extra rules, erratas etc. and even adding written corrections to rulebooks. But this is not what I’d expect from a self-contained product range. While the core DS product is looking mighty fine and fun with the biggest issues I’ve seem around thus far being a missing card for a single backer and some minis that will need the warm water treatment. So basically peanuts, but the state of the Adventurer’s Companion is going to put off a lot of people as this is essentially where the continued survival of the game will take place. None of it is the end of the world, but even after a quick look there’s already a few wrong entries, types and the missing page reference numbers, so who knows what will pop up over the next week or two as people get really stuck in. The adventurers companion issues are a problem given that after looking at the minis that is probably the first thing a lot of people are reading. The Character creation looks good and the monster section while short seems to pack a lot in. The other sections it is much harder to judge. AI while looking detailed had no concrete examples to help you learn it, and random is all about what the cards say. The Design your own Dungeon section though probably needs a total rewrite. Jake clearly wrote it from his point of view in making dungeons to be played by thousands but the customer is looking for help in making a fun dungeon to be played once by his friends. Telling me to playtest it a lot is the exact opposite of what I want and paid for in a book. I’ve known about Gate of Antares for more than two years. Heck, I was a backer on the canceled Kickstarter. Warlord Started talking about a November release for the game months ago, and they’ve been slowly growing the supporting line over the last year or so. This was a move long telegraphed. The November 7th release date is a fairly recent announcement (only about a month ago), but they always planned to have it out before the end of this year. GW’s simply not that agile. They might only announce products a week in advance, but those releases are planned for ages. Not only do they need to coordinate worldwide product releases, but produce the supporting White Dwarf magazine in multiple languages. The Horus Heresy plastics have long been rumored, but as usual GW won’t confirm or deny anything. The one thing I’ll grant you is that they’re hyping the Horus Heresy stuff two weeks in advance, which is EXTREMELY unusual. But I attribute that more to the fact that the last week of Tau releases is lackluster (just the Tidewall component boxes) and supplemented by Age of Sigmar re-releases – and they know it. Any sort of acknowledgement that a competing product even exists, let alone has a release date the same day isn’t even in GW’s corporate playbook. I won’t be buying any Horus Heresy plastics. 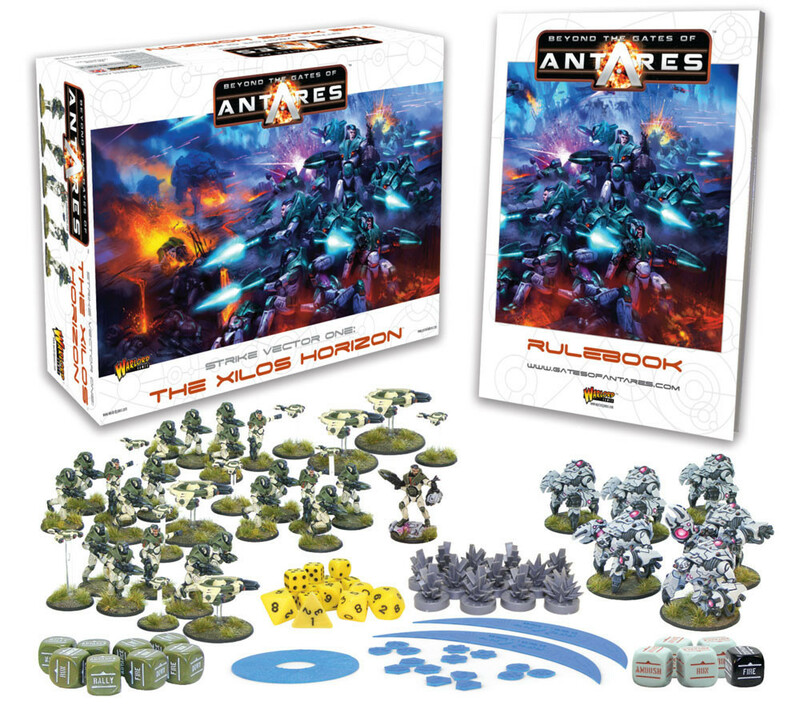 But I will be heading to Fall-In here in the states to try and get some Antares Demo games — my preorder should be in transit if not arrived by then, too. Got the new issue of WD today, it seems this is a standalone game played on hex tiles.